Border cities view themselves as neighbors and oppose a wall, according to a poll by Cronkite News, Univision News & Dallas Morning News. New poll by Cronkite News, Univision News and The Dallas Morning News shows strong sense of community on both sides of the U.S.-Mexico border. Despite heated political rhetoric about the U.S.-Mexico border, people who live in the region largely view themselves as one community, believe in making it easier to cross back and forth and do not favor building a new wall, according to a Cronkite News-Univision News-Dallas Morning News poll. The poll is the first of its kind in more than 15 years and reflects the attitudes of nearly 1,500 respondents in 14 U.S. and Mexican cities from California to Texas. The poll, with a margin of error of plus or minus 3.7 percentage points, was conducted in May by Austin-based Baselice & Associates, Inc. It included questions on quality of life and cross-border relations, and was conducted in person and over the phone in both English and Spanish. Baselice did the last poll in 2001, before the 9/11 terrorist attacks. The border poll was funded by the media partners and the public, through the crowdfunding platform Beacon, which matched the contributions. A team of Cronkite News reporters and photojournalists traveled to several cities along the 2,000-mile border to get reaction to the poll findings and hear the views of border residents, community leaders and poll respondents. Seventy-two percent of respondents on U.S. side and 86 percent of those interviewed on Mexican side said they are opposed to building a wall. Seventy-six percent of Mexicans said they don’t trust their law enforcement officials while 82 percent of those polled on the U.S. side said they do trust their authorities. Fifty-one percent of those polled on the Mexican side and 54 percent on the U.S. side said they oppose the legalization of marijuana. Residents on both sides describe a sense of community and dependency with their sister cities across the border, with 79 percent of those polled in Mexico and 86 percent in the United States saying they like their neighbors. Chants of “build the wall” have been heard at rallies for Republican presumptive nominee Donald J. Trump, who has made building a wall along the border a cornerstone of his campaign. On the border, it’s a different story. San Diego resident Daisy Garcia, 32, said the national portrayal of the border does not reflect the daily reality for most people who call the region home. “I think when people think about the border … it’s probably all the violence and insecurity,” Garcia said. “I think there’s a negative connotation to ‘the border,’ when in reality, I don’t think it’s that bad,” explaining the area is among the safest in the country. Poll results show significant opposition to building a wall, with 77 percent of Mexican respondents and 70 percent of U.S. respondents saying a wall is not important in comparison to other issues. Many border residents said a new wall would not deter those who want to cross the border illegally or smuggle drugs. “I don’t care what you put up; somebody’s going to find a way to get over it,” said Irene Riley, 70, a border resident living in Columbus, New Mexico. In Mexico, resident Roberto Montijo, 26, a student at the University of Sonora in Nogales, Sonora, is among those who spoke out against a building a new border wall. The majority of Mexican respondents (62 percent) and nearly half the U.S. respondents (47 percent) said they felt the federal government does not understand the needs of the border region, such as cutting bridge wait times or generating well-paying jobs to help with a brain drain. “Our government does not understand border problems,” said Armando Quintana, 70, a retired banking employee who lives in Tijuana. “Our government is concentrated in the center of the republic and does not understand the northern region of the country,” he said, explaining that nationalistic views in Mexico City fail to understand how dependent border communities are to one another. Poll results indicate that border residents — 88 percent in Mexico and 77 percent in the United States — favor easier mobility across the border by shortening wait times at the border crossing and easing requirements for people on either side to cross. A path to citizenship for unauthorized immigrants who live in the United States has huge support, according to the poll, with 90 percent of Mexican respondents and 82 percent of U.S. respondents in favor. Poll respondent Rangel feels the presidential race has no real impact on border life. “Whether Hillary Clinton or Mr. Trump wins, Nogales will be the same or worse,” said Rangel, explaining that the border remains isolated, misunderstood and only a topic of debate during campaigns. In Mexico, 68 percent of respondents placed crime and security concerns in their top three most important issues — up 25 percentage points from 2001. Additionally, 76 percent of Mexican poll respondents said they don’t trust law enforcement officers in their country — in contrast with the 82 percent of U.S. border residents who said they do trust law enforcement in their country. 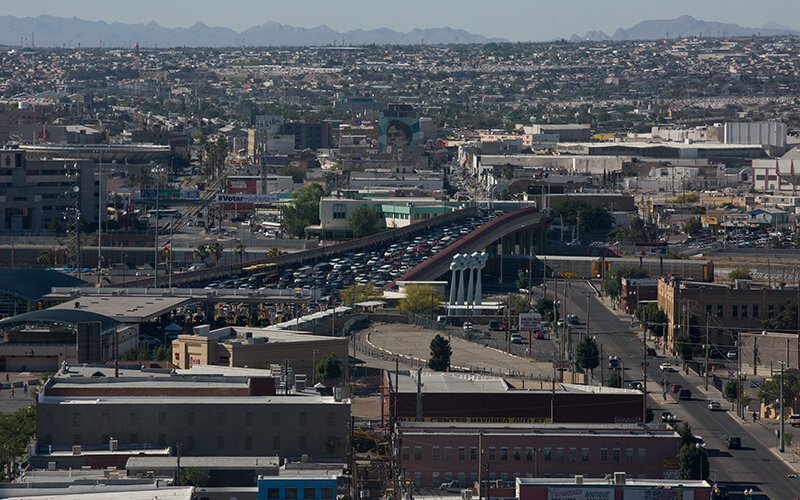 “Honestly, if I’m driving at night or during the day and I see a police officer, I feel scared rather than safe here in Ciudad Juarez,” said Tomás Domínguez, a resident of the Mexican border city. Border regions in Mexico that have experienced drug-related violence have also had to cope with increased police corruption. Though violence has declined in several border cities in Mexico, residents remain concerned about another spike. Forty-one percent of U.S. respondents said the economy and jobs are most important, while 40 percent of Mexican respondents did the same. Economic difficulties, including employment, are a critical issue in Nogales, where residents on the Arizona side have seen shops close because of a fluctuating currency exchange rate and the weak Mexican peso. In Nogales, Arizona, 54 percent of residents say a lack of jobs that pay well has worsened during the past 15 years, when Baselice did the last border poll. Poll results show that Nogales, Sonora, has the highest percentage of respondents along the border who make less than $370 a month, at 66 percent. Many Mexican border cities that depend heavily on visitors from the United States have also seen tourism die as violence spiked in Mexico. In Columbus, New Mexico – a town of only 1,760 people – lack of tourism because of fears of violence in the neighboring city of Palomas has hit the economy hard, said Mayor Philip Skinner, 69. Though they may have different priorities, border residents view the cities across the border as one community, according to the poll. Asked if they like their neighbors on the other side, the majority of respondents — 79 percent in Mexico and 86 percent in the United States — said yes. Additionally, 69 percent of respondents in Mexico said their city depends either somewhat or very much on their sister city across the border. In the U.S., that number was even higher at 79 percent. 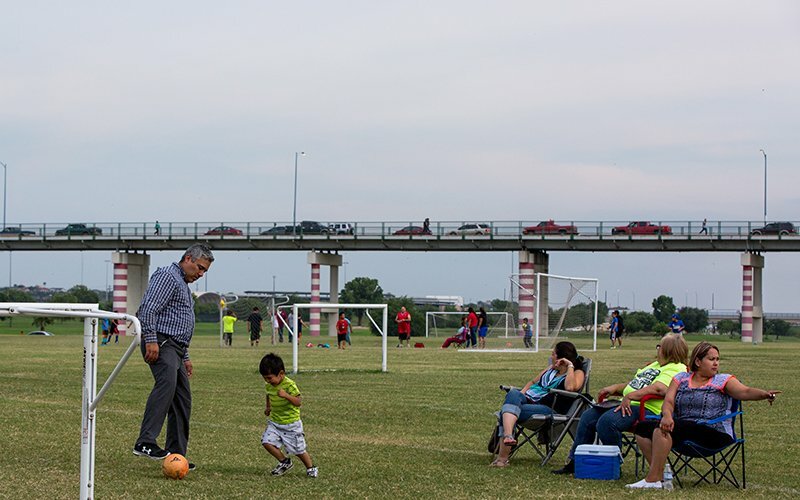 Calai Hernández (third from right) watches her son’s soccer team practice at Shelby Park in Eagle Pass. Behind them is the International Bridge that connects Eagle Pass Texas to Piedras Negras, Coahuila. A plurality of respondents — 45 percent in Mexico and 38 percent in the United States — called the people on the other side of the border “neighbors” rather than choosing other descriptions in the survey, including economic competitors, trading partners, criminals or racists. Border residents often cross into their sister cities to go shopping, visit family and attend school or work. And most value their shared sense of community forged by history, business and blood ties. Calai Hernandez, 35, who lives in Eagle Pass, Texas, across from Piedras Negras, Coahuila, visits Mexico regularly.